Behind the scenes of the local writer's art collection. 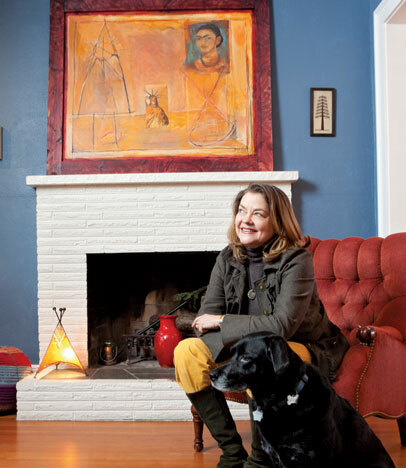 “I’ve never thought of myself as an art collector before,” Frances McCue says, with excitement. A poet, McCue considers herself more of the literary type, having served as founding director (1996–2006) of the Richard Hugo House writing center and currently teaching writing and literature to undergraduates as writer-in-residence at University of Washington. But step inside the cozy North Capitol Hill home she shares with her teenage daughter, Maddy, and it’s immediately clear: This aesthetically appealing abode could only belong to a true art lover. In addition to work by local artists such as Mary Ann Peters (an abstract in charcoal and oil), Dixie Peaslee (a petite rainy scene in oil) and Wes Wehr (an illustration of bugs in turtlenecks), McCue collects pieces by artists she has encountered on repeat trips to Morocco—journeys originally inspired by Daoudi—including small henna on animal hide paintings by Zini. Also in the dynamic mix: Maddy’s surprisingly mature portraits. Art is a choice—but it doesn’t have to be an expensive one. McCue can’t afford to spend much on art (between $5 and $800), but when she sees something she really wants (“It’s a switch that flips inside you”), she does the math to make it feasible. “I’d rather dress like a hobo [a complaint Maddy has lodged] and be able to buy art,” she says. FIND IT: McCue prefers “finding things in the wild” to shopping at galleries. You can make the hunt easier by visiting some of her favorite artists online: mohammeddaoudi.com; dixiepeaslee.com; maryann-peters.com. Seek out Wes Wehr’s tiny, wonderful illustrations at Davidson Galleries in Pioneer Square.